Make Mom's special day even more memorable this year a unique and special gift. 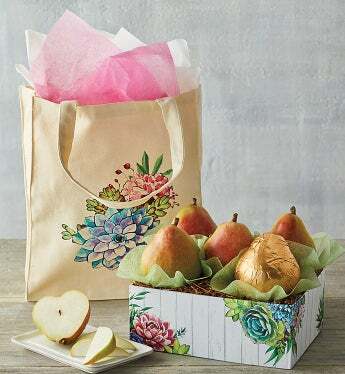 Our juicy and delicious Royal Verano Pears are sweet enough to enjoy as dessert, arriving in a decorative spring box for a beautiful presentation. The accompanying tote bag is a long-lasting reminder of how much you care and bears a stylish floral design that Mom is sure to love.